AFRICANGLOBE – The decision also renders futile the European Union’s decision to exclude President Mugabe at its meeting with African states in two months time. President Mugabe’s election as the First Vice chairperson makes him automatically eligible for the chairmanship in 2015. It simply defies logic why the West has continued to expose itself so badly in its bid to isolate President Mugabe and play archaic politics of divide and rule, which no longer have a place even in the chaotic scheme of international politics. But this systematic attempt to marginalise President Mugabe from international engagements is not without basis given the fact that all attempts at regime change in Zimbabwe have dismally failed. In the eyes of the West, Mugabe has committed countless cardinal crimes that threaten their hegemonic economic interests on the continent. First, President Mugabe is the last real bastion of defence in terms of ideological and intellectual muscle to resist machinations by the West to entrench a “horse and rider” economic arrangement that only benefits them at the expense of Africa. President Mugabe has reiterated at various international forums the need for a new world economic order that empowers Africa to be masters of their own resources. 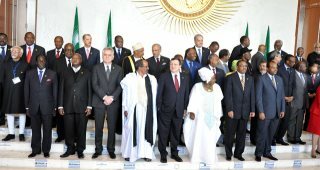 Mugabe’s demand is informed by the fact that although the independence of Libya in 1951 marked the beginning of the end of “formal” colonial rule — a process that also culminated in majority rule in South Africa in 1994, African countries have continued to be hamstrung by a residual exploitative web linking them to their former colonisers. The Zimbabwean leader is also exasperated by the fact that many important policies affecting the future of African politics and society are coded in Paris, Washington, Berlin and Tokyo — the capitals of the so-called four Great Powers that have remained heavily involved in African affairs since the beginning of the 21st century. The second reason to try and isolate President Mugabe stems from the fact Zimbabwe is arguably the only country in Africa in the post-colonial period that has initiated and implemented wholesale affirmative action policies meant to address historical colonial imbalances that favoured the minority Whites and marginalised the indigenous African majority. The land redistribution exercise still stands as a monumental historical initiative yet to be surpassed or photocopied by any African state. While the land reform programme has empowered thousands of indigenous African people, the West has not forgiven President Mugabe for compulsorily acquiring land from their White tribe, some of whom were mere absentee land lords. The third factor for President Mugabe’s exclusion stems from the fact that all initiatives for a regime change in Zimbabwe have failed as the ZANU PF leader has always emerged the winner in all successive elections held since 1980. Informed by all these developments, it must therefore come as no surprise to see African leaders rallying behind President Mugabe. The decision to rally behind him is an indication of the rising assertiveness by African leaders in assuming greater influence in international relations. Their bold stance can also be interpreted as a reflection of their growing consciousness of the pervasive intrusion of Western nations in the affairs of individual African nations. “We must now speak with one voice and make sure we act in the interest of Africa. Zimbabwe’s Minister of Foreign Affairs Simbarashe Mumbengegwi was more explicit in explaining both the election of President Mugabe as the First Vice chair and the decision to boycott the EU-Africa summit in the absence of Zimbabwe. Minister Mumbengegwi said the election of President Mugabe was sure proof of the confidence that the AU has in Zimbabwe and that the First Vice chair normally becomes the next chair of the African Union and the next chairmanship of the continental body is expected to come from Southern Africa. He stated that the decision by the EU to bar Zimbabwe from attending the meeting in April was untenable given the fact that President Mugabe was now the Vice Chair. “Now, how could one say they do not want the First AU Vice Chair to be at the summit? “That would be ridiculous; it would be absurd! It means the EU’s decision has gone up in smoke,” quipped Minister Mumbengegwi soon after the AU meeting. President Mugabe even led the gathering as the Chair as President Joyce Banda the current AU chair was absent. Despite shrills of disapproval from the likes of MDC-T’s Ben Freeth who described President Mugabe’s election as a travesty of justice, neutral observers have hailed the AU’s decision as showing growing awareness by leaders to always speak with one voice especially on issues that threaten the survival of their people. Besides rallying behind President Mugabe, the AU has urged its members to unite to protect more of their fellow members by preventing criminal proceedings at the International Criminal Court against sitting presidents. All these revolutionary stances are a clear indication that the collaborative politics of yesteryear are slowing being discredited and, in the words of Malcolm X, all thinking people who have been oppressed are by natural instinct expected to be revolutionary. The slain Afro-American civil rights leader’s words have come to life in the present epoch especially when he said “any time you find somebody today, who is afraid of the word ‘evolution’ get him out your way. He is living in the wrong era. Previous articleDoes Being Latina Exclude Me From Being Black?